Christchurch is not part of England's itinerary for their current tour, due to the damage caused by the earthquake two years ago, but the city plays a big part in the history of contests between the two teams. It staged the country's first Test, in 1930, witnessed Ian Botham's infamous run-out of Geoff Boycott in 1978, and in 2002 was the venue where Nathan Astle scorched his way to the fastest double-hundred in Test cricket. However, perhaps the city's most famous match came in 1984, when Richard Hadlee inspired New Zealand to a massive innings victory, bowling England out for double figures twice. New Zealand had fought back to draw the opening game, batting for 187 overs in their second innings, and so were buoyed arriving in Christchurch. The effort, meanwhile, had taken a toll on England's attack, which was hit by injury, leading to an SOS being sent out to Tony Pigott, the Sussex seamer who was playing domestic cricket for Wellington - and also had some important plans for the weekend. Tony Pigott It was the third morning and the Wellington captain, Ervin McSweeney, asked me to bowl through as Central Districts were looking for a declaration. I said I couldn't. My legs had gone. Then at lunch I had a phone. The voice [of the England team manager] said, "Alan Smith here", and I replied with, "Yeah, sure. Who is it really?" before realising it wasn't a prank. He explained the injury problems and told me to get a flight to Christchurch. He asked if I was fit, to which I replied, "Yep, I'm very fit, no problems about that" and asked if I had any plans I couldn't change for weekend. "Well, I'm due to get married but I'm sure we can sort something out." The following day I made my debut. Geoff Howarth, the New Zealand captain In the previous three or four years we'd built up a very confident attitude. We were confident about playing anyone at home. But with this particular Test - and 20-20 hindsight is nice - it was perhaps lost before a ball was bowled. There was a provincial game that ended quickly and the pitch got a real slating. I think this got into the minds of the English players. There was also an interesting selection in the New Zealand team. Stephen Boock, the left-arm spinner, was recalled for the first time in three years. Stephen Boock I'd been a bit pissed about not being picked. Nobody was really told why after I was sent home from the 1980 Australia tour because I wasn't going to be playing the one-dayers. The Christchurch paper actually did a cartoon showing me walking off the field carrying suitcases, with the line "Boock abandons sinking ship." I was successful in first-class cricket but thought my international days were done. We were playing England in a match in Alexandra and halfway to the ground we'd agreed to stop for some lunch. Obviously there were no cellphones in those days so I hadn't heard the squad selection. I walked into the pub and everyone cheered. It was a bit surreal. New Zealand won the toss and batted first*. England made early inroads on a pitch that had already caught the attention. Pigott It was cracked before we started. It wasn't a good pitch. We started okay, I managed to get Bruce Edgar for my first wicket, so that was a special moment. Before we went out, we had a team talk about how to bowl to the New Zealand batsmen. Botham's advice was: "Bounce Coney, bounce Crowe, bounce Hadlee, bounce Wright. In fact, bounce them all." So, on a pitch where all we had to do was bowl decent line and length, we tried to bounce them out. Boock The weather had been awful leading up the match. The ball was always going to do plenty and we couldn't believe how England bowled. I'm not sure if it was an ego thing, but it was all halfway down. Howarth In the first over of the Test, a ball from Bob Willis flew over John Wright's head. That sowed the seeds of doubt, because of what they'd read about the pitch. They just played in a very cavalier style after that. New Zealand wickets always tend to do a bit, but this wasn't an awful pitch. New Zealand's middle order recovered well, led by Hadlee's swashbuckling 99 off 81 balls. Richard Hadlee I swung the bat and it came off. But England didn't bowl very well. They continued to bang the ball in. We were racing along. I was nicked off for 99 but was still pretty happy. Especially so when it later turned out that England couldn't make that in either of their innings. Pigott When Richard came in, he just teed off. He slogged it. It was like playing in a Sunday League game. I was coming around the wicket and he was slogging me over midwicket for four. Eventually Willis bowled a better length and we knocked over the tail, but walking off, I thought 300 was a very good total on that pitch. Boock Richard never particularly liked facing short-pitched bowling, but on this occasion he just kept swatting it away. He played his own style of the hook shot, where he was never really behind the ball, and he barely scored a run in the "V" down the ground, which was when he looked so good with the bat. Graeme Fowler fell to the last ball of the first day, leaving England 7 for 1, and it gave Boock a memorable moment on his return. Boock It was two minutes to six, so a typical over-of-spin-before-the-close type of thing. Geoff Howarth chucked me the ball. Fowler just played inside my first delivery. I couldn't really believe it - three years after my last Test. Then we walked straight off. I got changed into my No. 1s and went out for a drink. I walked into the local and everyone cheered. On the second morning the mayhem really began. The start was delayed by rain and conditions aided the swing bowlers. Chris Tavaré fell early to Hadlee, and David Gower padded up to one that swung back. By the close, England were 53 for 7. Pigott Fowler, Tavaré, Gower, Lamb, Gatting, Botham, Randall - that was a decent top seven, but New Zealand bowled very well. Hadlee was one of the greatest there has been and didn't need a helpful pitch to be a handful. I walked in at 47 for 7 for my first innings in Test cricket and thought, "Well, this is interesting." Hadlee was very aggressive, and there were a few of my Wellington team-mates in the New Zealand side, very good friends, and I promise you, it was like a war out there. It was an experience, that's for sure. Hadlee There were some decent conditions to bowl in, for sure, and we had some excellent seam bowlers in Lance Cairns and Ewen Chatfield. It was one of those games where they nicked everything and we caught it. Boock I think I fielded at short leg for a lot of that match - with a helmet but not much other padding. I was trying not to get hit, so I spent most of my time watching the batsman, but you could tell when Richard was bowling well, because of a late flick of his wrist. The whole New Zealand attack was made for that pitch, but he was lethal. Howarth It was a dream for a captain. Everything went better than you could have imagined. Most New Zealand sides have been made up of one or two top-class international players and then a host of good provincial, first-class cricketers. But this team in the '80s was one of those where I believe we had maybe seven top players, and that made all the difference. England could not get past the follow-on on the third morning and were put straight back in by Howarth. Hadlee was soon at it again. Mike Gatting and Botham made ducks. Boock There was a bit in it for the spinner, too, although I was never a huge turner of the ball. In a way, I was also more focused on just making sure I got another Test. 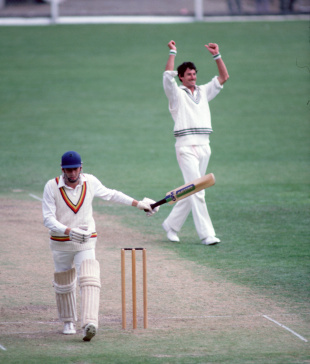 There weren't often many wickets left to take when Hadlee was in this form, so I enjoyed getting Gatting and Botham. Hadlee They tended to make a lot of excuses, like the pitch, but you can't blame the pitch for being caught on the boundary or run out. England were not focused on that game and we took advantage. Howarth Hadlee couldn't do it all himself, and he had some terrific back-up. It was a hotch-potch of poor batting skills. To be bowled out for 100 on each occasion on that pitch was not on. I think it was all to do with what had happened with the odd ball early in the Test match. Pigott It all happened so quickly it was hard to take in what the senior players were thinking. We were a very experienced side and squad, but it was one of those matches where you were just completely outplayed. Boock We could tell there was a strange culture around the England team at that time. It was also a good era for us. Almost every series we played, we started as underdogs but we were also determined to stand up for ourselves.